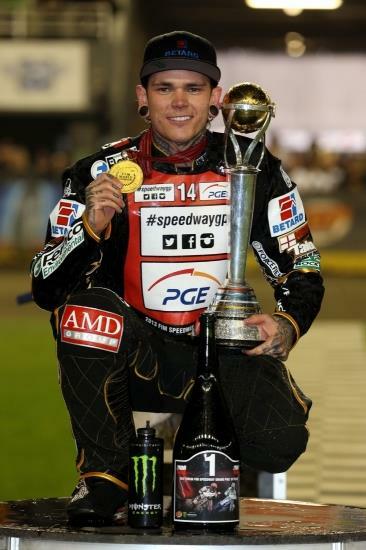 World speedway champion Tai Woffinden’s troubled start to his title defence continued in the second Grand Prix of the season in Bydgoszcz, Poland tonight. The 23-year-old from Scunthorpe scored five points, his lowest score in Grand Prix racing since he returned to the series at the start of 2013. And it could have been worse as Woffinden was sat on just two points before he took a determined victory in the last of his fifth qualifying heats. It was an even tougher night for fellow Brit Chris Harris, who collected only two points from his five rides. The rain-affected meeting was won by Poland’s Krzysztof Kasprzak, who dropped only two points in the qualifying heats and dived underneath the impressive Australian Darcy Ward on the last corner of the final to secure the GP win. The Pole’s total score of 18 points moves him into the world championship lead, with previous leader Nicki Pedersen hanging onto second in the standings despite a disappointing haul of five points in Bydgoszcz. Woffinden, who struggled in the opening round in New Zealand earlier this month after suffering an injury seven days before the meeting, is now down in 12th place in the championship. He’s 20 points behind Kasprzak and admitted in a TV interview during the meeting that he had problems to fix before he could get back on the world championship pace.